Yes, I know it’s a holiday but we’re playing just the same. However, this is NOT a holiday theme. The person in the photo is Angela, our house guest. 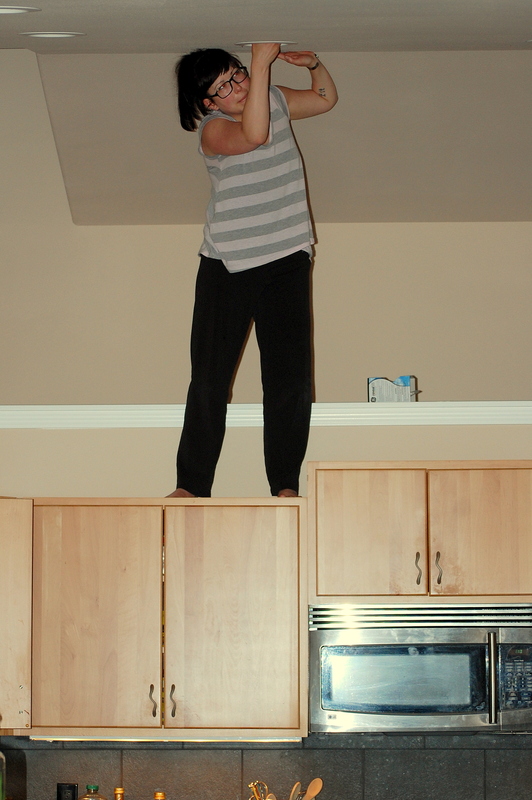 Yes, she is standing on top of the kitchen cupboards. That’s the only way she could reach the 20 ft. ceiling to change the light bulb. No, we did not make her do this. She volunteered — as long as I would take her photo and put it in Punny Monday. Here it is. Start guessing! What compound plural NOUN does this photo represent? EMAIL your answers and leave a comment designed to either help or confuse your fellow game players. The first contestant to EMAIL me the right answer wins a featured link in my blog which will display until next Monday when we’ll play this little game again. Enjoy. Ack! Something went wrong in the posting ladies. It’s fixed! OMG! You wouldn’t get me up there! Mumma — I’m on the ground with you! The landlord assured me that he hung the cabinets and they’d hold an elephant, but I wasn’t going to try. Angela was up for the adventure though! 😀 nice pic, still no guess, though! happy 4th of July! Thanks, Mar! Keep thinking. It will be a long while before I post the answer. Betty — the builder is bigger then Angela and he stands up there. He says the cupboards will hold an elephant. I don’t plan on testing that. Brave woman! I have many crazy thoughts, but not sure. Happy 4th. Betty — hi! Great to see you! Happy 4th! And mercy! You could build a whole ‘nother house on top of those cabinets! I would love this kitchen though. I love light airy spaces. Linda — out entire house is light and airy. I love it! Bright lights and open spaces. My guess is coming your way,. Hi Quillly 🙂 ~~ I am glad you had help today but with her you two have really made it tough. Mine are pretty far out but I just got up this morning and have had only one cup of coffee so far. I wanted to make your cut-off. Jim — your guesses are WAY far out. In this case the compound noun is two words put together, not a sentence strung together with hypens! Your guesses always crack me up though. This one has left me even more clueless than usual! Obj, and is it the answer to how many acrophiles it takes to screw in a lightbulb? Genius as always. I really was a dim bulb this weekend. Love “cabinet secretaries.” I had no idea this week and unfortunately not much time to ponder before we were off for the day. You have a very nice guest! I would have been worried though. How many screws are holding up those cabinets? Scary.